Meat Protein. No Soy. 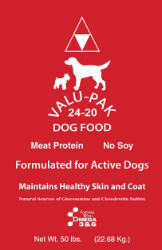 Formulated to meet the nutritional levels established by the AAFCO Dog Food Nutrient Profiles for all life stages. Pork Meal, Ground Whole Grain Corn, Ground Soft Wheat, Chicken Fat,Chicken By-Product Meal,Rice Bran, Corn Gluten Meal, Cereal Food Fines, Flaxseed,Salt, Potassium Chloride, Calcium Carbonate,Hydrated Sodium Calcium Aluminosilicate, Choline Chloride, FerrousSulfate, Vitamin E Supplement, Zinc Sulfate, Zinc Oxide, ManganeseSulfate, Copper Sulfate, Sodium Selenite, Niacin Supplement, Biotin,Calcium Pantothenate, Vitamin A Supplement, Riboflavin Supplement, Menadione Sodium Bisulfite Complex, Thiamine Mononitrate,Vitamin B12 Supplement, Calcium Iodate, Pyridoxine Hydrochloride,Vitamin D Supplement, Cobalt Carbonate, Folic Acid.